STAFDA 2018 was held in Phoenix with plenty of excitement. The only downside is that the show ended too early for us to get around and see everything we wanted to. Bringing the list down to just our Top 10 wasn’t easy, but we made some tough calls and brought it together. To check out more from Pro Tool Reviews and some of our other friends in the business, search #STAFDA or #STAFDAPHX18 on your favorite platform. When you’ve got a load of sheathing to stitch, Senco’s new staplers are something you should definitely consider. Built with a focus on industrial level design, they can fire up to 14 staples per second. You’ll get fewer jams thanks to a new solid latch spring design that allows for a tighter drive track. At $219, the NS20XP gives you 15% more power than the current competition and the $289 NS20BXP gives you another 20% more power over the XP. We’ve been talking a lot about Hitachi’s name change to Metabo HPT. Now it’s time to talk about the tools. Metabo HPT’s MultiVolt batteries have the ability to switch between 18V and 36V depending on what tool they’re in. Sound familiar? Of course, it does. But what the boys in yellow don’t have is an AC adapter that works in every Metabo HPT MultiVolt tool from their rotary hammer and impact wrenches to the table and miter saws. Southwire is making long wire pulls easier with their new Maxis XD1 circuit puller. Using a premium drill with at least 1000 in.-lbs. of torque, it will give you 600 pounds of continuous pull force at a manageable 30 feet per minute. Additional features include a fish tape hook to make starting easier, a conduit adapter to get right up on the conduit, and a cleat to grab hold of the box edge while you’re pulling. Including the drill, the whole system weighs in at 14 pounds. You can pick this one up for $1500. DeWalt’s FlexVolt dust extractor isn’t just another cordless dust extractor option. It brings a legitimate 125 CFM to the table, allowing you to work with 5″ grinders and still be Table 1 compliant. Using the FlexVolt 6.0/2.0 Ah battery (the vac runs at 60V), DeWalt tells us they’re getting 20 minutes of continuous runtime. Using the included remote control to kick it on only when you need it, that should give you several hours of hole drilling on one charge. Look for some future Tool Connect products that take advantage of the RF connection for auto on/off down the road. This one will have a retail price around $399 bare and $599 with two 6.0/2.0 Ah batteries. One of the most exciting accessories we saw comes from Bosch. Their new Nail Strike spade bits have a thicker head with a cutter geometry optimized to cut through any nails you encounter. They’re a nice middle ground between their Daredevil spade bits and an auger bit. Expect to cut through 30 nails before the cutting edge dulls to make it a great option for drilling when you’re not sure if there are nails you’ll hit. They keep Bosch’s threaded tip design and will retail for roughly double the price of Daredevil spade bits. Sawsquatch is extending his reach with a new 16″ Carpentry Chainsaw for Skilsaw. 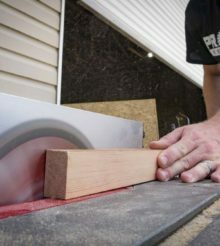 It uses a full house chain (cutter every link instead of every other) with a 14-1/2″ cutting depth to make easy work of those thicker beams and timbers. You can bevel up to 60° and even change the angle of attack to give you a better cut. While you’re still going to have some sanding to do on the back end, it leaves a better finish than something like a Prazi attachment with a standard chain. Look for the newest Sawsquatch to come out in April with a retail price around $699. Milwaukee just announced their latest M18 Fuel SDS-Max Rotary Hammer. With the breakthrough of their 12 Ah High Output battery, this is a 1-3/4″ model that gives you 8.1 ft.-lbs. (11 Joules) of impact energy to go with 380 RPM and 2900 BPM. Milwaukee isn’t leaving it all up to the specs, though. They also include a soft start and an e-clutch. The clutch ensures that the tool won’t rotate beyond 90° if the bit binds up, greatly reducing the risk of injury. Slated for January 2019, the 2718-21HD will retail for $999 with a 12.0 Ah High Output battery and rapid charger or $799 if you want the bare tool. Most of the popular dust extractors will give you 150 CFM at the top end, give or take. When you need more, many options jump into $2500+ range. Bosch now has a 300 CFM dust extractor that lets you use up to a 12″ grinder. For those of us not built like Captain America, it means we can use the Y-adapter to have two 6″ grinders running at the same time and be completely OSHA Table 1 compliant. The cost – a much lower $1500. Diablo is expanding what your circular saw is able to do and one of those areas is metal cutting. Their new 7-1/4″ Steel Demon Cermet blade turns your circular saw into a metal cutting beast – even in stainless steel. Whether you’re working in fabrication, plumbing, or just like cutting up metal pipe to blow off steam, this $29.97 blade is a much more cost-effective and efficient way of cutting through metal than some of the other options out there. Makita is launching the world’s first cordless chop saw! The XWL01 is an 18V X2 product that is built on Makita’s corded model. You get the same 14″ abrasive wheel capacity and that fantastic tool-free wheel change mechanism. And of course, you don’t have any cords to worry about. In internal testing, Makita is getting up to 100 cuts in 20 gauge stud using a pair of 5.0 Ah batteries. It’s the perfect solution for metal cutting where there’s no or inconsistent power available. Look for this in late November/early December retailing around $499 for a kit with two 5.0 Ah batteries and Rapid Optimum Charger or $349 as a bare tool. That’s it for our Top 10 Tools at STAFDA 2018. Tell us what you’re looking forward to the most or if there’s something on your list that didn’t make ours in the comments below!